Beacons are one of the most interesting new technologies for libraries and will emerge as being increasingly important in the coming years. Here’s some stuff to learn more about them. “1. What is a beacon? A beacon is a small wireless device that constantly broadcasts radio signals to nearby smartphones and tablets. Think of it as a lighthouse emitting light in regular intervals. Mobile apps can listen for that signal and, when they receive it, trigger a location-based action. 2. Why is Bluetooth low energy (BLE) important? BLE is the signal emitted by beacons, and it’s important for two reasons. First, it transmits radio waves, which can penetrate physical barriers like walls, unlike Wi-Fi or cell signals, which are often disrupted. Second, BLE consumes only a fraction of the battery power that classic Bluetooth does. 3. Do beacons work with iPhones and Android phones? Yes, but they work differently. Only iOS 7 devices constantly scan for BLE and wake up relevant apps — even if they are closed — when they come within range of a beacon. iPhones and iPads can do this thanks to Apple’s iBeacon protocol (more on that below). Android devices, on the other hand, do not have a beacon system of this type at the operating-system level. Android apps must therefore scan for BLE, meaning that for Android users to interact with beacons, they have to have the app running on their phone, at least in the background. Beacon scanning at the app level means there is more of a battery drain for Android users. 4. What is an iBeacon? Is it just an Apple beacon? Sort of. iBeacon is not an off-the-shelf beacon that retailers can buy and install in their stores (at least not yet). Apple has filed documents with the Federal Communications Commission, which suggest that the company wants to manufacture iBeacon hardware. Currently, iBeacon is a system built into the latest version of Apple’s iOS 7 mobile operating system that lets iPhones and iPads constantly scan for nearby Bluetooth devices. When iBeacon identifies a beacon, it can wake up relevant apps on someone’s phone, even when an app is closed and not running in the background. Additionally, iPads and iPhones can act as beacons; they can emit beacon signals to wake up apps on other iOS devices. 5. What does Apple’s iBeacon technology do? iBeacon lets iPhones and iPads constantly scan for nearby Bluetooth devices. When it identifies a Bluetooth device, like a beacon, it can wake up an app on someone’s phone — even if the app is not running. Developers can make their apps responsive to iBeacon by using Apple’s Core Location APIs (application programming interfaces) in iOS. 6. Do beacons beam data to phones? Beacons do send small bits of data, typically a unique identifier. This allows mobile apps to differentiate between beacons and perform an action when necessary (that is, a location-triggered notification). Think of it as the combination of a hyperaccurate GPS coordinate or an IP address. The identifier consists of three components: a UUID, which is specific to a beacon vendor; a “major,” which is specific to a region, like a store location; and a “minor,” which is specific to a subregion, like a department within a store. 7. If, as a retailer, I purchase beacons from a vendor, how do I know they’ll work with my app? “More than half of the top 100 U.S. retailers are testing beacons in stores this year. How big will the beacons market become? BI Intelligence finds that these small devices are the fastest-growing in-store technology since mobile credit card readers. The beacon installed base will see triple-digit growth rates over the next few years. 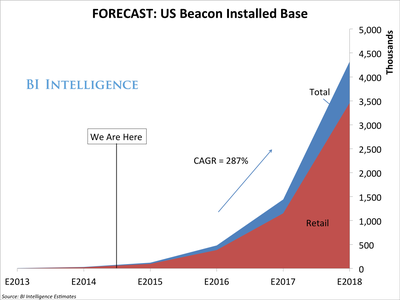 The beacon installed base will consist of 4.5 million active beacons overall by year end 2018, with 3.5 million of these in use by retailers. The full BI Intelligence report includes the five-year CAGR for beacons. 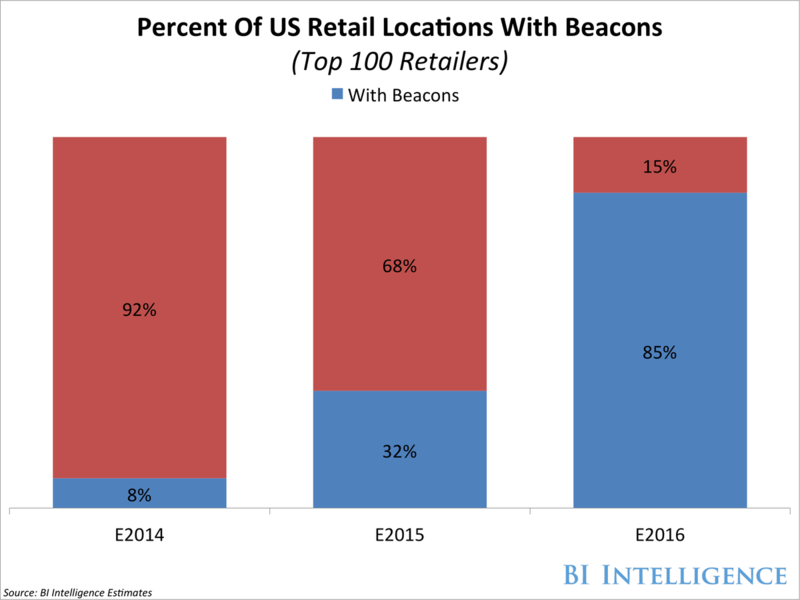 Half of the top 100 retailers in the U.S. are testing beacons this year, and we expect them to have this new technology installed in one-third of their store locations by the end of 2015.